These events allow families to come together to support each other, learn about latest treatment options, and provide an opportunity for kids to meet others who have eczema. 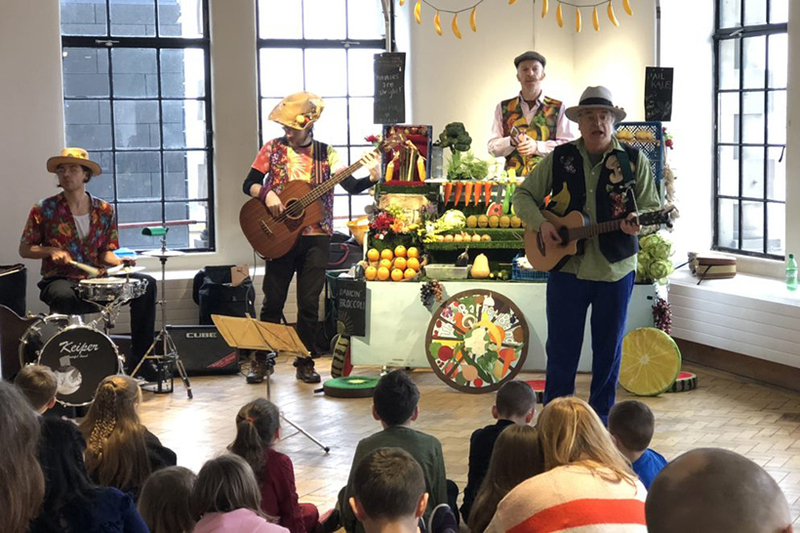 Families were entertained by The Barrow Band, who perform songs about fruit and vegetables. They even gave away potatoes, carrots, mushrooms and more as prizes for answering questions on the subject at hand! Ewan Eadie, Lead Clinician for Photonet, the National Managed Clinical Network for Phototherapy in Scotland spoke with parents about ultraviolet (UV) phototherapy which is available in Scotland for those with acute eczema. Meanwhile, teenage members took part in a consultation event on a brand-new app being designed for them. Watch | Here's a wrap from the weekend's Learn & Share Family Day at the City Art Centre in Edinburgh. Tag someone who should see this! And amongst many activities, our younger kids played ladders. In this game, they throw the dice to climb the ladder, answering questions about their own eczema care in order to proceed each time. This type of game helps the children develop some resilience and understanding of the condition, and encourages them to try and take care of themselves. John Armstrong was there with his son Matthew. “From coming to events like this Matthew sees that other children have similar conditions to what he has,” he said. Claire Anderson has two children who have eczema. She says that the expert advice from specialists is a huge benefit to families. Our Head of Services, Christine Roxburgh, was delighted with how the event went. “We were delighted to see such a good turnout for our latest event,” she said. “These Learn & Share days provide a fantastic forum for families to come together in a way in which everyone can get something important. “For example, it’s so important for our children and young people to meet and see others who have eczema. It can feel a lonely place, but to know you are not alone is incredibly important. For parents it’s a chance to learn from each other, compare notes, and vent frustrations. “We also use these events to bring experts in their field to speak. Ewan Eadie was able to provide parents with some incredibly useful advice, and as ever there were many questions.